When it comes to fitness, one of the most striking features of the human body is a solid set of shoulders. Don&apos;t believe me? Take pencil to paper and draw two silhouettes with the same ripped quads and tapered waist, but give them different shoulders. Arm one with a stacked set of caps, and the other with shrunken shoulders. See the difference? The curvature of the shoulders influences how you view the physique. A standard silhouette appears average, but titanic traps and rounded shoulders are clear signs of a killer body. To achieve an above-average silhouette, you have to perform exercises and utilize loads that push your body beyond its comfort zone. 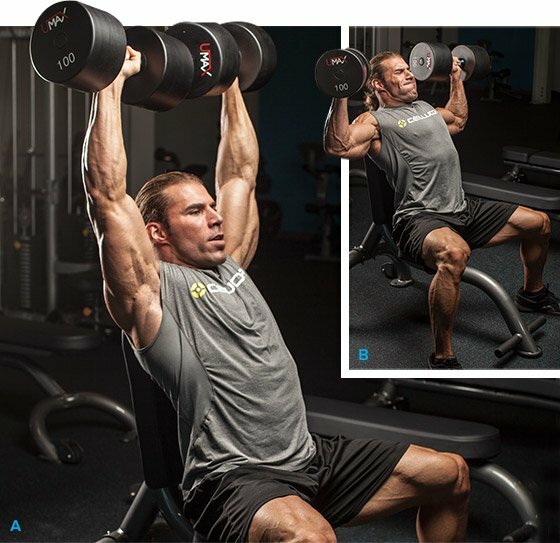 The workout below manipulates volume and intensity to develop your deltoids. My style of training is heavy volume training (HVT), which is my own twist on max-effort training. Heavy, by definition, is "of great weight, hard to lift or carry, of great amount or quantity." Heavy volume training demands that you exert near-maximal force and energy through the prescribed reps of a specific exercise until your working muscles reach failure. HVT demands that you lift heavy weight for a lot of reps. The idea is to recruit as many muscle fibers and cause as much stress as possible. This stress and damage will set you up to grow more down the road. Post-workout, you&apos;re likely to experience inflammation and pain in your muscles. This is known as delayed onset muscle soreness (DOMS), and it&apos;s your body&apos;s way of protecting itself while it begins to repair cells and fibers damaged during your workout. With ample rest and the right nutrients, this muscle-recovery process sets you up for additional size and strength. Remember, working out strips muscles down, and resting rebuilds. You don&apos;t have to push for DOMS every time you train, but you should break out of your comfort zone to stimulate a cycle of new growth. We start off with 100 reps of dumbbell shoulder press. Before you begin the workout, strategically select one weight to use throughout the entire 100 reps. How do you know which weight to choose? Grab a weight that you can lift for 17-20 reps with good form. When your form breaks, or you need a spot, end the set and rest for 2-5 minutes before going on to the next set. If you choose your weight correctly, you should find yourself finishing 100 reps between 6-9 sets, with 7 sets hitting the sweet spot. If you find yourself taking more than 9 sets to finish, you might have overestimated your current strength and endurance for this specific exercise. If you finish in fewer than 6 sets, you&apos;re coasting and need to add more weight the next time. For the second half of the workout, you&apos;ll have 6 exercises in 3 grouped supersets of 30 reps. Once again, pick a weight that pushes you to near failure in the expected rep range. If you miss on any of these supersets, feel free to rest-pause until you finish that particular set and adjust the weight on your next round. To finish the workout, we have 2 exercises of 30 reps. Use a weight that you can lift for strict 25 reps, which you should be able to push to 30 reps with the rest-pause technique. This workout is HV105 from my HVT e-book. Check out my heavy-volume legs workout and more great HVT workouts by searching for "HVT ebook" here!